Under the IPA’s guidance five departments are now working closely developing a presumption in favour of off-site construction by 2019. In order to further this work we hosted a two day workshop for the newly formed working group. 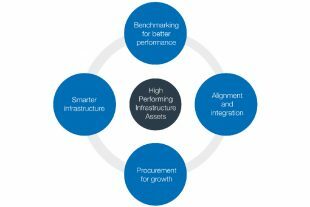 Modern Methods of Construction (MMC) is one of the central themes of our Transforming Infrastructure Performance (TIP) programme. Modern methods such as offsite manufacturing and digital construction can bring greater speed, quality and efficiency which ultimately delivers better value for money and helps boost productivity in the Construction sector. Representatives from various departments and delivery bodies came together and shared their journey to date on MMC. They discussed ways of overcoming barriers and maximising the opportunities of collaboration across departments. The group recognised that sharing best practice was crucial to successful delivery. This is because any approach to manufacturing for construction requires both sustainable pipelines of repeatable work and the ability to approach challenges in a consistent way rather than in isolation. The workshop enabled the group to gain a collective understanding of the key differences between Construction and Manufacturing of built assets. Innovate UK also presented the Industry Challenge Strategy Fund (ISCF) and Transforming Construction Programme as part of the Construction Sector Deal. This work follows the Autumn Budget where the government announced the award of up to £170m via the ISCF to support the industry adoption of digital, manufacturing and whole life performance goals. The group will continue to meet to collaborate and support each other in their move to a presumption in favour of offsite manufacturing for construction in 2019. This workshop was the essential starting point and as work progresses we will share updates. Follow us on twitter and keep a look out for our progress.